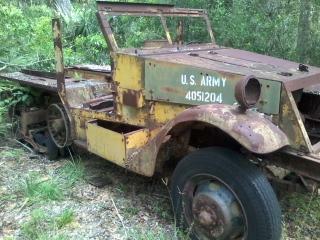 Sister halftrack to mine, was in Florida . . .
Been a long time since I've posted, other projects have kept me away from working on the halftrack but we're now back on it. There will be another couple of distractions with maintenance on other vehicles and such before the end of the year but hopefully I'm back to it with a vengeance now. What I'm wondering this evening though is this . . . I've got a better look at the chassis number of my halftrack now that there are more parts removed and, after looking up the list of known halftracks on the G503 Halftrack Database, it seems that there is (or was) another vehicles very close to mine. According to the database there was a White M2 (rebuilt as an M2A1) in Florida that was for sale online. It is serial number 234044 and this is very interesting to me as mine is serial number 234033. Two vehicles with such close chassis numbers is interesting to me especially as I have so much work ahead of me during my restoration. It would be awesome to speak to the owner or even former owners of 234044 and see what I can learn about theirs, particularly if they know hood numbers and the delivery date of that halftrack. Re: Sister halftrack to mine, was in Florida . . .
234044 belongs to me and a couple of buddies, it was in a huge pile of parts we bought along with 2 other halftracks, both M3's. I don't know much about it except it came to Florida from out west and was supposedly used as a school bus on an native reservation. We want to sell it. It has the complete rear bed and track armor. It is still here in FL. I had someone in the UK that wanted to buy it but we don't have a title for it so that was a deal killer. It has a hood number on it that I think is bogus since the hood was repainted and it was one digit off another m2 the same guy had that sold before we got there. I can look it up but I think going off the frame number it was built in 1942. It was steel floor tread plates. I remember seeing that very halftrack appear on facebook a while ago, didn't realise that it was 234044! You don't know what the ordnance number is do you? I'm trying to figure out some more information about mine and as 234044 is only 11 numbers different I figured that they would be reasonably similar. Amazing to think that these two halftracks will have been in the factory, near enough next to each other (or behind one another) and now they are on opposite sides of the Atlantic. Sadly my rear bed has not survived, mind you the front floor hasn't either, but I've got one coming (or at least parts of the floor). She's going to be a massive restoration job, if you've seen the very few other posts that I've done then you can see from the pictures what I'm working with. On top of that I've never restored a halftrack before so talk about a steep learning curve! Unfortunately the data plate is gone so ord# is unknown. I think it was probably a winch model like yours. Probably going to end up parting out 234044.